The Indian state of Goa is one of the most important tourist hotspots in India. Located along the western coast of the country, the state attracts people from all over the country as well as abroad. Famous for its vast sandy beaches, Goa has become very popular among people interested in a seaside getaway. In addition to beaches, the state also has numerous cultural and historical attractions. Being colonized by Portugal for centuries, the state has a distinct Portuguese flavour that is unlike other states in the country. Last but certainly not the least; Goa is blessed with extensive and verdant greenery. This is especially apparent in the eastern regions which are largely hilly and most of which are covered by tropical jungles. Should one be looking for excellent accommodations in Goa, there are certainly plenty of amazing choices to select from. 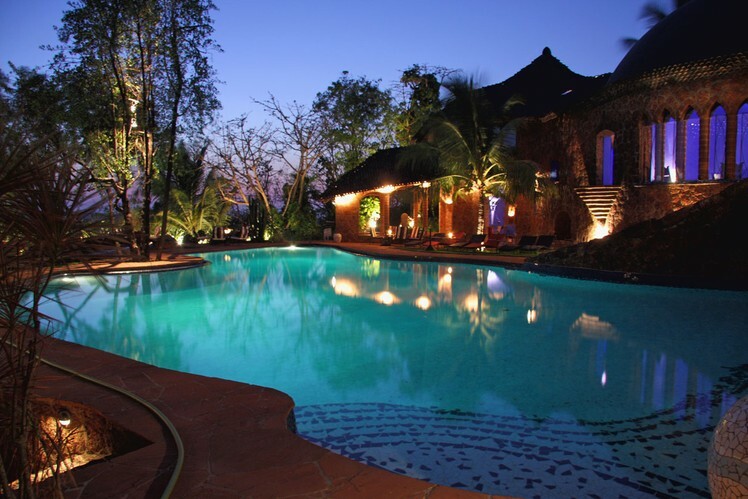 Mentioned below in the list are some excellent 5-star hotels in North Goa to choose from. 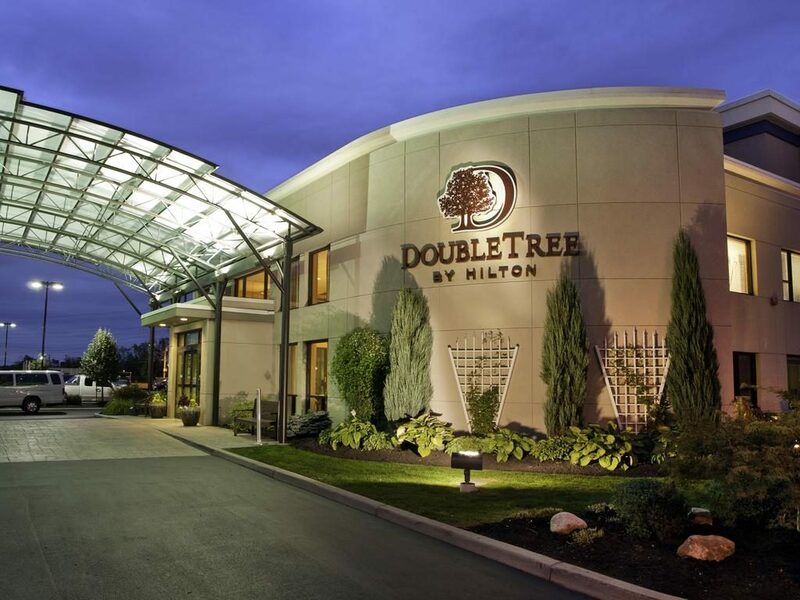 The Doubletree by Hilton is an excellent luxury resort located at Arpora. Situated a short distance away from the coast, the resort provides an amazing level of comfort and luxury to all its guests. 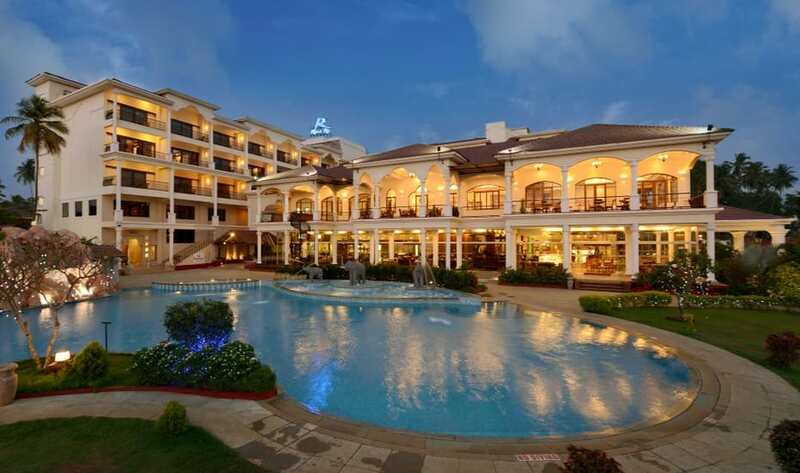 The resort itself has been built using architectural styles that merge the colonial with the modernist. In addition to this, the place also has well-landscaped gardens and an ambience conducive to a peaceful and serene holiday. With regard to the rooms, guests have plenty of different amenities and features to make for a most memorable stay. The Starting prices for rooms begin at Rs 5, 600. The facilities that are available include Pool, Free Parking, Fitness Centre with Gym / Workout Room, Room Service, Restaurant, Bar/Lounge, Breakfast included, Free High Speed Internet ( WiFi ), Free Parking, Room Service, Meeting Rooms, Business Centre with Internet Access, Concierge, Banquet Room, Children Activities (Kid / Family Friendly), Shuttle Bus Service, Airport Transportation, Breakfast included, Dry Cleaning, Conference Facilities, Laundry Service, Multilingual Staff, Breakfast Available, Air Conditioning, Refrigerator in room, etc. Resort Rio is one of the best luxury resorts in all of Arpora. The resort is spread across an approximate 10 acres of land on the banks of Baga River and surrounded by beautifully landscaped gardens. In addition to this, the entire resort has been designed in accordance with architecture which reflects the bygone era of Portuguese colonization. With regard to the rooms at the hotel, the resort offers well-furnished rooms with all major amenities and features. Last but not the least, the resort is very close to the beach, with the seashore being located just a short walk from the resort premises. The Starting prices for rooms begin at Rs 6, 400. The facilities that are available include Pool, Room Service, Free Parking, Restaurant, Bar/Lounge, Spa, Fitness Centre with Gym / Workout Room, Free Internet, Room Service, Free Parking, Children Activities (Kid / Family Friendly), Business Centre with Internet Access, Shuttle Bus Service, Airport Transportation, Dry Cleaning, Meeting Rooms, Laundry Service, Concierge, Banquet Room, Multilingual Staff, Conference Facilities, Babysitting, Air Conditioning, etc. The Nilayala Hermitage resort is an excellent luxury stay in Arpora. Situated on top of a hill, the resort is surrounded by greenery and natural beauty on all sides. 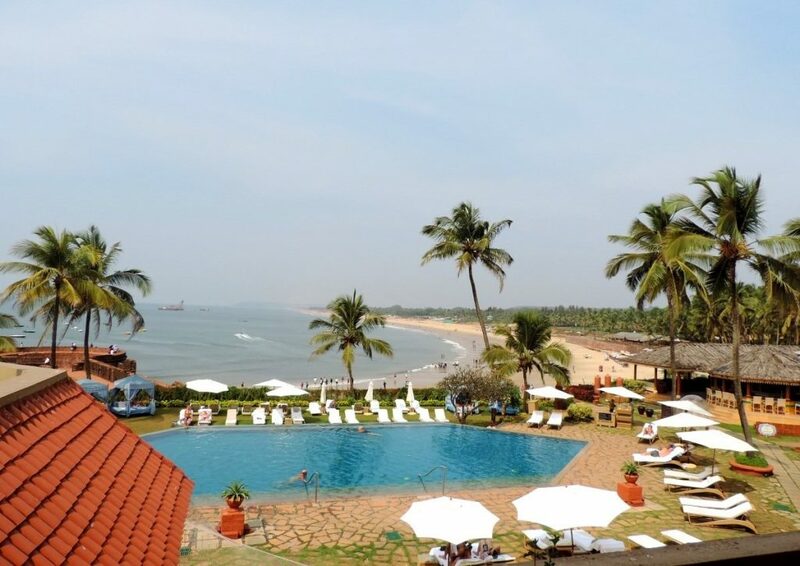 It also happens to have an excellent view of the Arabian Sea and the surrounding towns and villages. With regard to the resort itself, the place has been built using some of the best architectural designs around. This ranges from contemporary and modernist styles to the more traditional Goan styles, be they individual or colonial in origin. Coming to the rooms, guests can look forward to plenty of amenities and features, all of which make for a most comfortable stay. Last but not the least, the place is very close to all of the major attractions that exist in the vicinity. The Starting prices for rooms begin at Rs 10, 000. The facilities that are available include Pool, Room Service, Restaurant, Free Internet, Free Parking, Bar/Lounge, Spa, Breakfast included, Fitness Centre with Gym / Workout Room, Room Service, Laundry Service, Free Parking, Breakfast included, Dry Cleaning, Air Conditioning, etc. 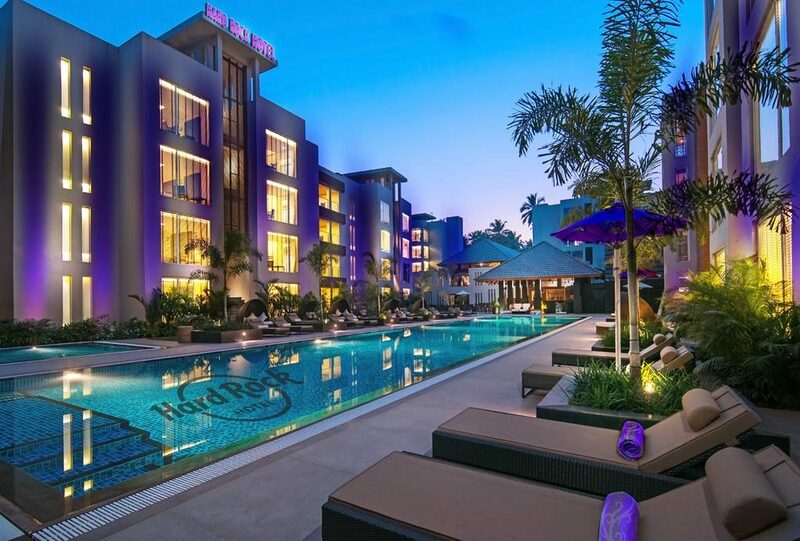 Hard Rock Hotel is an excellent luxury stay located right in the heart of Calangute town. Situated in one of the most popular holiday destinations in all of Goa, the place is an excellent choice to consider while holidaying in this part of the state. The resort is an excellent stay themed on the concept of music. Guests at the hotel can look forward to some great musical performances, be they of legendary, customized or anything in between. As for the resort’s design, the entire place is very in tune and reflective of the modernist styles and trends. Coming to the rooms, all of the rooms in the hotel are well furnished with major amenities and comforts. With regard to the beaches, the hotel is very near to all of the major beaches in the vicinity. The Starting prices for rooms begin at Rs 7, 600. The facilities that are available include Pool, Room Service, Free Parking, Restaurant, Bar/Lounge, Breakfast included, Fitness Centre with Gym / Workout Room, Free High Speed Internet ( WiFi ), Room Service, Free Parking, Airport Transportation, Breakfast included, Dry Cleaning, Meeting Rooms, Business Centre with Internet Access, Concierge, Banquet Room, Conference Facilities, Laundry Service, Multilingual Staff, Air Conditioning, Minibar, etc. 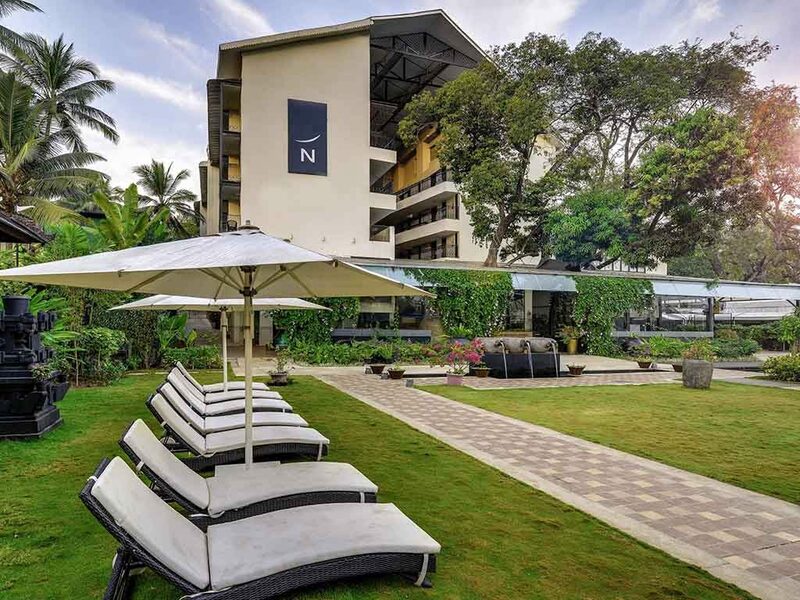 The Novotel Goa Shrem is a wonderful luxury stay in the town of Candolim. Situated in one of the most upscale parts of the town, it is a great choice for those who are planning on visiting this part of the state. The hotel is located at a very short distance from the beach, with the shore located just a few minutes’ walk away. With regard to the amenities at the hotel, one can look forward to plenty of modern amenities and features. The rooms have been designed with lots of attention paid to detail, be it for the decorations, furnishings or anything else. The Starting prices for rooms begin at Rs 8, 500. The facilities that are available include Pool, Fitness Centre with Gym / Workout Room, Room Service, Free Parking, Restaurant, Bar/Lounge, Spa, Free High Speed Internet ( WiFi ), Business Centre with Internet Access, Children Activities (Kid / Family Friendly), Room Service, Free Parking, Airport Transportation, Dry Cleaning, Meeting Rooms, Laundry Service, Concierge, Conference Facilities, Banquet Room, Multilingual Staff, Self-Serve Laundry, Babysitting, Air Conditioning, Minibar, etc. The Novotel Goa Resort and Spa is a completely different place of stay and not part of the Novotel Goa Shrem hotel. The place happens to be in the midst of greenery and nature on all sides. In addition to this, it also happens to have plenty of modern amenities and features. The place happens to be very near to the popular nightlife streets of Goa, with discos and nightclubs being a short walk away from the resort. In addition to this, the same applies to the beaches as well, which is located very near to the resort. With regard to the architecture of the resort, the place is largely based on traditionalist ideas and a few touches of various modernist elements. Also, the place is surrounded by beautifully designed and landscaped gardens which add to the aesthetics of the place. Last but certainly not the least, the resort is located very close to all major tourist attractions in the area. The Starting prices for rooms begin at Rs 10, 100. The facilities that are available include Pool, Restaurant, Room Service, Free Parking, Bar/Lounge, Spa, Free High Speed Internet ( WiFi ), Fitness Centre with Gym / Workout Room, Children Activities (Kid / Family Friendly), Shuttle Bus Service, Room Service, Free Parking, Airport Transportation, Dry Cleaning, Meeting Rooms, Business Centre with Internet Access, Laundry Service, Concierge, Banquet Room, Multilingual Staff, Conference Facilities, Babysitting, Air Conditioning, Minibar, etc. The O Hotel is an excellent luxury stay located in Candolim. Situated very close to Candolim beach, the place is an excellent place to enjoy an amazing vacation in this tropical getaway. The rooms and everything else in the resort have been designed in an elegant manner, using the latest trends. Also, guests can look forward to enjoying a great deal of amenities and facilities at the hotel. Furthermore, the seashore is located very near to the resort and is well within walking distance from the premises. In fact, one can actually see the beach and the Arabian Sea while still in the resort. The Starting prices for rooms begin at Rs 4, 700. The facilities that are available include Pool, Free Parking, Room Service, Restaurant, Beachfront, Bar/Lounge, Spa, Breakfast included, Fitness Centre with Gym / Workout Room, Free Parking, Room Service, Dry Cleaning, Breakfast included, Meeting Rooms, Business Centre with Internet Access, Laundry Service, Concierge, Conference Facilities, Air Conditioning, Minibar, etc. 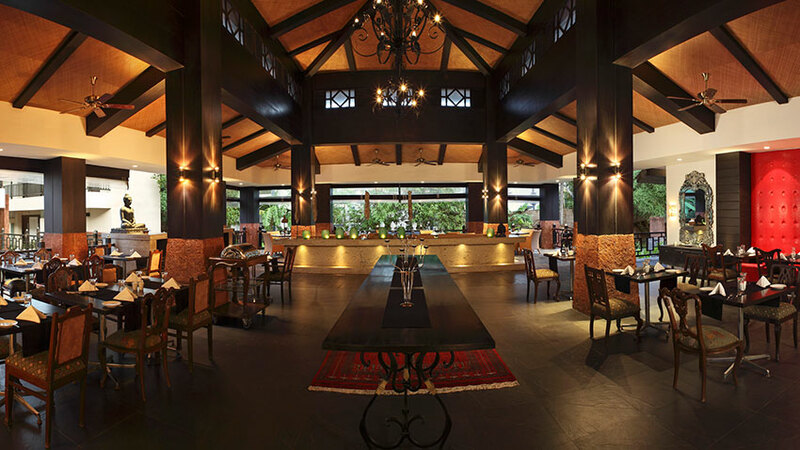 The Vivanta by Taj is an excellent place for one to stay in while at Goa. 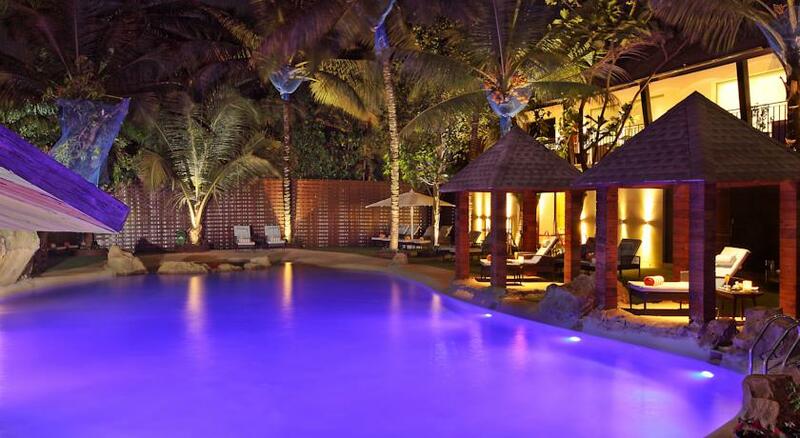 Situated in Sinquerim, it provides a most luxurious experience to its guests, in every possible manner. As is the case for all other places of stay under the Taj name, one can expect the same from the Vivanta when it comes to comfort and quality. With regard to the architecture of the place, the resort has an excellent blend of colonial as well as contemporary elements. In addition to this, the place is surrounded by beautifully landscaped gardens and coconut groves. Furthermore, the place is very close to the beach as well, with the shore being a short walk away from the resort. The Starting prices for rooms begin at Rs 14, 100. The facilities that are available include Pool, Fitness Centre with Gym / Workout Room, Room Service, Free Parking, Restaurant, Beachfront, Bar/Lounge, Spa, Free High Speed Internet ( WiFi ), Business Centre with Internet Access, Room Service, Free Parking, Children Activities (Kid / Family Friendly), Shuttle Bus Service, Airport Transportation, Dry Cleaning, Laundry Service, Concierge, Banquet Room, Multilingual Staff, Conference Facilities, Meeting Rooms, Self-Serve Laundry, Babysitting, Air Conditioning, Minibar, etc.